The MIC Series 400 stainless steel camera has been designed to offer an extremely reliable, robust, and high quality surveillance solution for security applications that demand the very best performance, regardless of the installed environment. Precision engineered to exacting standards, the range offers numerous benefits over the use of traditional dome and PTZ cameras with a range of options available to ensure a best-fit solution is achieved. 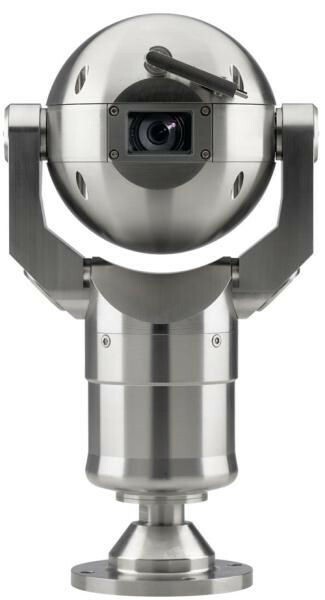 Rated to an industry leading IP68, the vandal resistant grade 316L stainless steel camera housing has enhanced corrosion-resistant properties to provide the ultimate protection in the harshest of environments, including marine applications where the salt content of the air is especially high and constant exposure can dramatically reduce the lifespan of traditional camera and dome units. Featuring an optically-perfect flat viewing window and integrated wiper, the MIC Series 400 stainless steel camera is able to capture razor-sharp images in even the most demanding conditions. The brushless motor technology offers ultra-reliable, whisper-quiet operation with full 360º continuous rotation pan and 270º tilt control for exceptional viewing capability. Small-increment pan/tilt speeds, from just 0.2º per second to 90º per second, give the user precise control. This speed control is especially important when used with video analytic systems, particularly for tracking subjects when fully zoomed in. A choice of true day/night camera modules offering up to 36x optical zoom (12x digital) are available, providing either 470 TVL NTSC/PAL typical (18x module) or 530 TVL NTSC/PAL typical (36x module). When coupled with upright, 45 degree canted, or inverted mounting capability, the MIC Series 400 stainless steel camera allows the perfect field of view to be achieved every time. Subjected and certified to rigorous IP68 dust and immersion tests, the MIC Series 400 stainless steel camera is perfectly suited for installation in the most unforgiving environments. Faultless operation, either upright or inverted, gives the user a host of mounting and viewing possibilities. A canted option is provided for upright pole-mounted applications, allowing the base of the pole to be viewed. Hot or cold, rain or shine – regardless of the weather, the MIC Series 400 stainless steel camera is able to capture the highest possible quality image all year around thanks to its integrated, long-life, wiper and heater. Compatible with virtually any control equipment available today, the MIC Series 400 stainless steel camera is able to seamlessly integrate with the vast majority of security systems.